The alba-form coloration of this Central American species makes an unusual and lovely display. 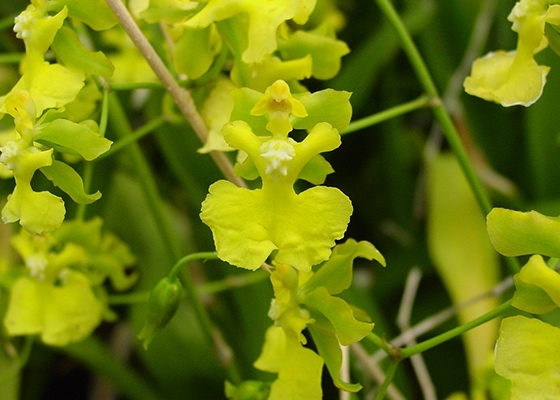 The flowers' main feature is the bright yellow lip with white callosum accent which is all elegantly offset by the clear green petals and sepals. The flowers are produced in a lacy spray arrangement on arching stems that can reach up to three feet long. This plant is grown outdoors at our nursery alongside the Cymbiidiums. .Temperature Tolerant. October blooming. Species from Mexico and El Salvador.